James Naismith was a Canadian farm boy from Almonte, Ontario, a small town just a few kilometers from Canada's capital city, Ottawa. He was born on November 6, 1861. His father and mother died when he was eight and thereafter he made his home with an uncle. He wondered about his future and decided that "the only real satisfaction that I would derive from life was to help my fellow beings." In 1883 he left Almonte for McGill University where he earned a degree in theology. While studying at McGill Naismith was influenced by D.A. Budge, General Secretary of the YMCA of Montreal, to pursue a career in the YMCA and to study at the YMCA International Training School in Massachusetts (later to be named Springfield College). Naismith attended as a student in 1890 and was asked to join the faculty in 1891 by Dr. Luther Halsey Gulick, the director of the physical education department. During a psychology seminar Dr. Gulick challenged his class to invent a new game. Gulick was desperately looking for an indoor activity that would be interesting, easy to learn, and easy to play indoors in the Winter. Such an activity was needed both by the Training School and YMCAs across the country. Naismith believed that one way to meet that challenge was to take factors of known games and recombine them. At the same time Dr. Gulick assigned Naismith one particular class that was completely uninterested in the routine exercises, marching and mass calisthenics that formed a part of their compulsory daily physical education session. Three instructors have gone down in defeat trying to rouse enthusiasm in this group of young men. 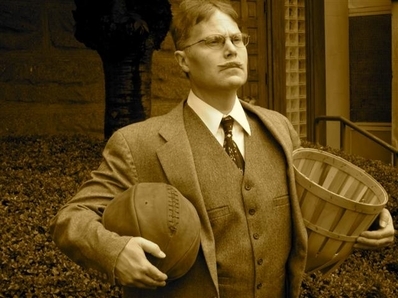 "When he had assigned me the class of incorrigibles," writes Naismith in his own version of the invention of the game basketball, "I had felt that I was being imposed on; but when he told me to do what all the directors of the country had failed to accomplish, I felt it was the last straw". Naismith struggled with the class of young men with no success. He made attempts at modifying football and soccer. "I had pinned my hopes on these two games and when they failed me, there seemed little chance of success," writes Naismith. He tried lacrosse, a game he had learned to play in Almonte, Even though some members of the class were Canadians and knew how to play the game, it didn't succeed. The beginners were injured and the experts were disgusted; another game went into the discard. "With weary footsteps," recounts Naismith, "I mounted the flight of narrow stairs that led to my office directly over the locker room. I slumped down in my chair, my head in my hands and my elbows on the desk. I was a thoroughly disheartened and discouraged young instructor." The game that grew out of Naismith's discouraged but determined spirit on that day has since gone worldwide, attracting millions of players and spectators young and old. It was invented by a man sitting at his desk thinking it through. "As I sat there at my desk, I began to study games from the philosophical side. I had been taking one game at a time and had failed to find what I was looking for, this time I would take games as a whole and study them". Naismith then methodically studied the elements of existing team games and factored out a number of specifics he would mold into a new game. "My first generalization was that all team games used a ball of some kind; therefore, any new game must have a ball." He settled on the existing Association (soccer) football after eliminating smaller balls because they were difficult to handle, could be hidden, and required equipment to use them, thereby making the learning of skills more difficult. He sought a game that could involve many and was easy to learn. Tackling, a popular component of football, was a problem in Naismith's mind, he could see the carnage that would result indoors on wooden floors. "But why was tackling necessary," he reasoned, "It was because the men were allowed to run with the ball, and it was necessary to stop them. With these facts in mind, I sat erect at my desk and said aloud: 'If he can't run with the ball, we don't have to tackle, and if we don't have to tackle, the roughness will be eliminated.' I can still recall how I snapped my fingers and shouted, 'I've got it! 'He then concluded that a game must have an objective, and there must be some kind of goals, but he eliminated the goal used in soccer, lacrosse and hockey and turned instead to a game he played as a child called "Duck on the Rock." "With this game in mind, I thought that if the goal was horizontal instead of vertical, the players would be compelled to throw the ball in an arc; and force, which made for roughness, would be of no value. A horizontal goal, then, was what I was looking for, and I pictured it in my mind. I would place a box at either end of the floor, and each time the ball entered the box it would count as a goal. There was one thing, however, that I had overlooked. If nine men formed a defense around the goal, it would be impossible for the ball to enter it; but if I placed the goal above the players' heads, this type of defense would be useless." He settled on a toss-up between two players as a way to start the game after considering several alternatives. Naismith was ready to try the new game with the class and set down on a scratch pad the first set of 13 rules in less than an hour. A stenographer typed them up. He asked the building superintendent to fetch two boxes about eighteen inches square. "No, I haven't any boxes," replied the superintendent, "but I'll tell you what I do have. I have two old peach baskets down in the store room, if they will do you any good." A few minutes later, baskets tucked under his arm and a few nails and a hammer in hand, Naismith tacked the baskets to the lower rail of the balcony, one at either end of the gym, posted the rules on the gym bulletin board and lay in waiting for his class of "incorrigibles." Naismith recalls, "The first member of the class to arrive was Frank Mahan. he gazed at me for an instant, and then looked toward the other end of the gym. Perhaps I was nervous, because his exclamation sounded like a death knell as the said "Huh! another new game!"' There were eighteen men in the class and Naismith promised them that if this game proved to be a failure he would not try any more experiments on them. They went over the rules, divided the group into two teams of nine players each and tossed up the first basketball in history. The date was December 21, 1891. 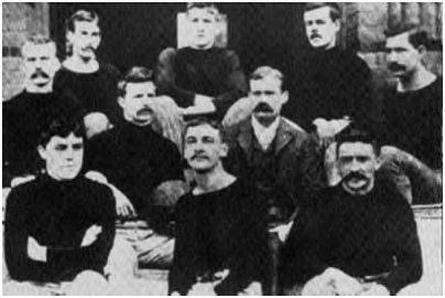 The first basketball team, consisting of nine players and their coach, on the steps of Springfield College Gymnasium in 1891. Back row: John G. Thompson, New Glasgow, N.S. ; Eugene S. Libby, Redlands, Cal. ; Edwin P. Ruggles, Milton, Mass. ; William R. Chase, New Bedford, Mass. ; T. Duncan Patton, Montreal, Que. Centre: Frank Mahan, Memphis, Tenn.; James Naismith, Almonte, Ont. Front row: F. G. Macdonald, Pictou, N.S. ; Wm. H. Davis, Holyoke, Mass. ; Lyman W. Archibald, Truro, N.S. The game was a success from the first toss-up onward and word spread that Naismith's class was having fun. Within a few days the class attracted a gallery. Teachers from a nearby girls school watched the game and took it away with them to organize the first girls' basketball team. Frank Mahan suggested the game be given a name, and he and Naismith settled on "basketball". In those earlier days of the game it was reported as "an uproarious game accompanied by much yelling and undignified cheering". In that respect it has changed little through the ages. "When the first game had ended", says Naismith, "I felt that I could now go to Kr. Gulick and tell him that I had accomplished the two seemingly impossible tasks that he had assigned to me; namely, to interest the class in physical exercise and to invent a new game." Naismith continued to control the development of the game and its rules for five years. he left Springfield for Denver to become the physical education director for the YMCA in that city and to study for his medical doctorate. On his graduation the University of Kansas was seeking an athletic coach and a director for their 650 seat chapel which students attended every morning. He was ideally prepared for the post and was recommended to the University as "..inventor of basketball, medical doctor, Presbyterian minister, teetotaler, all-round athlete, non-smoker, and owner of a vocabulary without cuss words."